Current holders Spain will notably begin the defence of their trophy in Group B against the Netherlands, the nation they defeated in the 2010 competition final, before facing tests against Chile and Australia. La Roja and Brazil will be keen to both win their respective groups to avoid a Last 16 meeting, with the competition hosts in Group A alongside Croatia, Mexico and Cameroon. Italy were the European team drawn out of Pot 4 to move into Pot 2 and face a tricky Group D alongside Uruguay, Costa Rica and England. One of the tournament favourites Germany also face a challenge in Group G, as they face Portugal, Ghana and Jurgen Klinsmann’s USA. 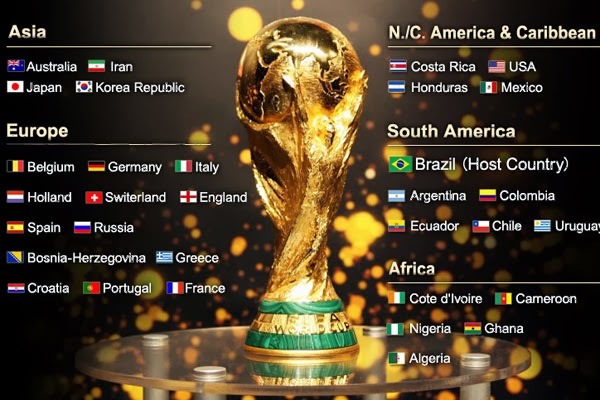 Friday evening’s draw at the Costa do Sauipe resort in Sao Joao da Mata, Bahia, has given Argentina and Belgium relatively more favourable groups, with the latter set for the least travelling across the country in the opening rounds.